The proceedings of a conference I attended two years ago in Heidelberg have been published as volume 18 in the series Schriften zur politischen Kultur der Weimarer Republik by Peter Lang. develops an analytical model to describe four dimensions of change in the modern discourse of cultural criticism since the late eighteenth century. Click here for the volume’s contents, a short introductory text, part of the introduction and the publisher’s page. In the new year, I will be presenting my research in various contexts. Politisches Schweigen: Sprachspiele an den Grenzen politischer Kommunikation, ca. 1815–1920. (Political Silence: Language Games on the Edges of Political Communication, ca. 1815-1920). Eine ‘Klage, die so alt ist, als die Geschichte’? 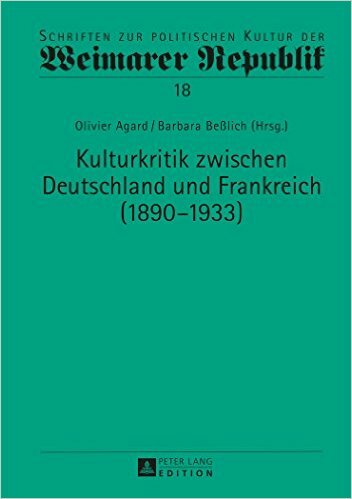 Kulturkritik um 1800 und 1900 im diachronen Vergleich. (A ‘Complaint, as Old as History Itself’? Kulturkritik Around 1800 and 1900 Compared). Beschleunigung: theoretische und empirische Perspektiven auf eine Kategorie der Moderne. (Acceleration: Theoretical and Empirical Perspectives on a Category of Modernity). My dissertation has been published as volume 18 of the series ‘Historische Semantik‘ by Vandenhoeck and Ruprecht. For more information, click here. For ordering from within Germany, click here. 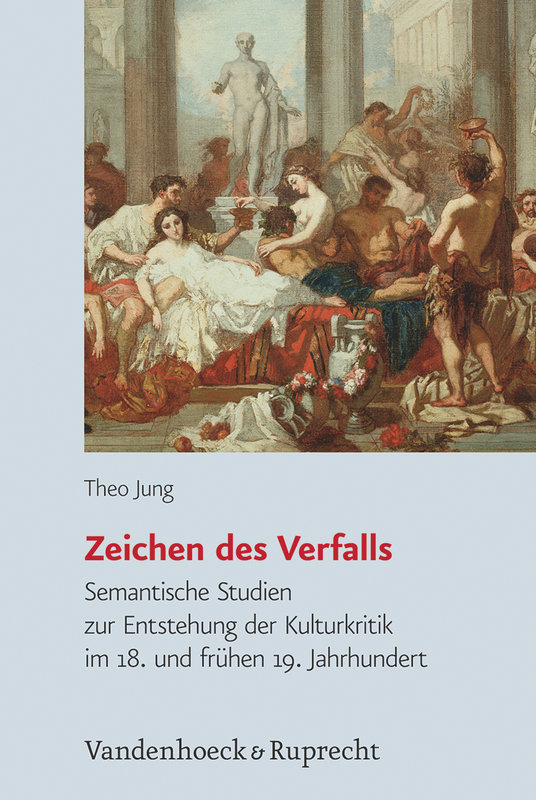 I’m honoured to announce that after the Fazit-Stiftung, now the Geschwister Boehringer Ingelheim Stiftung für Geisteswissenschaften has also generously awarded me a grant towards the printing costs of my dissertation, to be published this year under the title “Zeichen des Verfalls. Semantische Studien zur Entstehung der Kulturkritik im 18. und frühen 19. Jahrhundert”. I just received confirmation that the manuscript of my dissertation has been approved by the board of editors of the book series ‘Historische Semantik‘. This means that if all formalities add up, the final version of the text may appear in this prestigious series published by Vandenhoeck & Ruprecht, a publishing house with a tradition going back more than 275 years. Though the process of editing will take some time, a publication date in 2012 seems feasible. The editorial board consisted of Prof. Dr. Bernhard Jussen (Frankfurt / M), Prof. Dr. Christien Kiening (Zürich), Prof. Dr. Klaus Krüger (Berlin) and Prof. Dr. Willibald Steinmetz (Bielefeld). I’ve been invited to speak at the conference Perspektiven der Aufklärung (Enlightenment Perspectives) to be held in Bern on September 16th and 17th of this year. The event is organized by Dietmar Wetzel and Aleksander Zieliński, both from the University of Bern. Other participants include Sabine Maasen (Basel), Evelyn Gröbl-Steinbach (Linz), Claudia Honegger (Bern), Urs Stäheli (Hamburg) and Hartmut Rosa (Jena). Most of these are sociologists, so that I’ll have the opportunity to discuss a few of my more wide ranging hypotheses with a group of people specifically trained to grapple with general questions and models. Since many historians are – to say the least – less inclined to leave their sources behind to address more theoretical and abstract questions, I am confident this will be a very useful experience. The program can be found here, and the call for papers (with a description of the themes under discussion) here. My topic will be one that I have spoken about before, in Wolfenbüttel last year: the concept of Counter-Enlightenment. More specifically, I will address three questions. In what way and to what purpose was the concept of Counter-Enlightenment (anti-philosophie) used in the Age of Enlightenment? What role did the concept play in historiographical traditions about the Enlightenment? And finally: What are the strengths and weaknesses of the concept of Counter-Enlightenment as an analytical tool to understand the Enlightenment both as a historical phenomenon and as a general characteristic of modernity? My specific goal is to address the links between the concept of Counter-Enlightenment as an analytical tool and as a historical concept used in historical contexts. In my opinion it is too easy to just declare a clean break between the source language and the analytical framework, between the tools of the historian and his object. Whereas this can certainly be a viable goal, it will never be fully attainable. The reason for this lies in the fact that the language we use as historians to write about, but also to understand our source material as well as the world at large, is itself historically determined. The very same linguistic structures that are the subject of historical semantics still shape the semantical horizon within which this study is carried out. Therefore, self-reflection has to be an integral part of any study within the field of discourse analysis. This is all the more true in the case of the study of Enlightenment, the period in which our modern consciousness took shape. Later this year, I will address these same questions in a seminar at the University of Bielefeld.